Typically, Luis Suarez returned to Premier League action after his ten-match suspension with an exceptional performance. He scored twice in Liverpool's 3-1 win at Sunderland, although he was outshone by the brilliance of his strike partner Daniel Sturridge. The England international scored the opener and set up both goals for Suarez. The partnership already looks like it could become the most effective pairing in the Premier League. Their manager thinks so. "I'm not sure there's two better in the league," Brendan Rogers said. "These two can be the best in the country. The two of them looked very bright but they can only get better. Daniel is becoming much more of a team player. They are two very different players which makes it difficult for defenders. The dynamics look good." Of course, that depends on Suarez being willing to stay. He spent most of the summer attempting to contrive a move away from Anfield and those negotiations may resume once the January transfer window looms a little closer. For now it seems like he wants to show clubs what he can offer. Rogers admired Suarez's ability to rise to the occasion. "Luis is not fazed by much," he said. "He's got a remarkable mentality. His determination is just so focused. He's great for the team, great for the supporters." During his enforced absence, Suarez concentrated on improving his game and maintaining his sharpness. 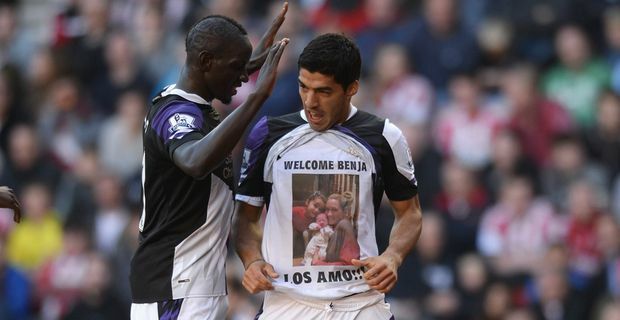 "Luis is someone who loves football," Rogers said, adding that the ban had been a major blow for the Uruguayan. "I know how much it hurt him. During it he wanted lots of extra work, extra finishing sessions, extra conditioning sessions. When he came back he wanted to be up to speed. He knew it would be very hard for him if he wasn't very good when he came back."